NEW YORK, 13 April 2018 – The prospects of around 800 million of the world’s poorest people remain dire. The global economy is experiencing a moderate upturn, and momentum around sustainable investing is growing, the UN said today. But the vast majority of investment is still short-term oriented and commitments by the international community to create sustainable economies are not being met. There is an increasing interest in socially responsible investing, but that is no substitute for a broader transformation in the financial system. The report states that the current system rewards investors, financiers and project managers that prioritize short-term profits. Similarly, policy makers are excessively focused on short-term considerations. But there is a price to pay. Infrastructure projects are shelved in favour of short term priorities. Small businesses and women remain excluded from the financial system. “If we don’t invest in infrastructure projects like bridges, roads and sewage systems, if the poorest and women are cut off from access to credit and other financial services, we have little prospect of achieving our global goals,” he added. Per capita growth remains negative or insignificant in many countries where the poverty rate is already high, entrenching inequality. Overcoming the short-term outlook of many investors is a complex but urgent issue, according to “Financing for Development: Progress and Prospects,” the 2018 comprehensive annual progress report on how to finance the Sustainable Development Goals. Pension funds, insurance companies and other institutional investors hold around $80 trillion in assets. But the majority of their resources are invested in liquid assets, such as listed equities and bonds in developed countries. Investment in infrastructure still represents less than 3 per cent of pension fund assets, with investment in sustainable infrastructure in developing countries even lower. According to the report, the solution lies in a multifaceted approach. It includes changing payment practices: the compensation of financial advisors and portfolio managers is too often linked to short term results. More transparency also helps: some countries now require all listed companies to disclose financial risks they face from climate change. Short-sighted policies also result in a lack of access to finance for countries in urgent need. Support for countries affected by disasters is often too little, too late. Innovative financial instruments exist that provide quicker access to funding. Countries can set up insurance-like mechanisms, and the international community can support those that can’t afford premiums. Loans can be set up to reduce repayments automatically during crises. But so far, major funders have not taken up these promising tools. It takes leadership to overcome short-term political cycles, devise and enforce rules which have widespread benefits but may face resistance by powerful groups, for example tax reforms and stopping illicit financial flows, the report notes. The report emphasizes that in donor countries, political leaders must do more to meet their commitment to provide financial assistance to the world’s most vulnerable countries. New technologies present boundless opportunities. However, in analyzing the potential of new technologies, the report warns that the transformative power of technology raises complex ethical, socio-economic and human rights challenges and risks. In the short-term, technological change could lead to job losses and increased polarization in labour markets. The report argues for adopting a long-term perspective, and calls on governments to make complementary investments, strengthen social protection and urgently develop regulatory frameworks so that benefits of technological change are shared broadly, and risks to privacy and data protection, financial stability and integrity are addressed. Gender inequalities persist in access to finance, technology, public services, decent jobs, unpaid care and domestic work, participation in policy-making processes and many other areas. Bank account ownership among women is about 58 per cent, and for men, 65 per cent. In Asia, only 16 per cent of businesses are women owned. Such inequality threatens achievement of the 2030 Agenda, but also weakens inclusive growth prospects by denying women opportunities to fully participate in the economy. 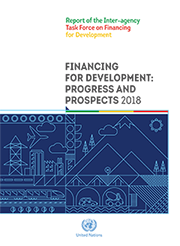 The Task Force report is available at http://developmentfinance.un.org/iatf2018. A document with selected facts from the report is available online. The report is written by the Inter-agency Task Force on Financing for Development and issued under the auspices of the United Nations Department of Economic and Social Affairs, by mandate from the Addis Ababa Action Agenda. The major institutional stakeholders of financing for development process are: the World Bank Group, IMF, WTO, UNCTAD and UNDP, which take a central role in the Task Force. The Task Force includes almost 60 UN agencies and international organizations, including the OECD and the Financial Stability Board. The report sets the tone for the spring meetings of the World Bank and IMF in Washington, D.C. (18-22 April).